I was at the Long Valley Ranger Station a few weeks ago. I noticed a sign outside, encouraging people to carry the Ten Essentials. It was the traditional list, which included matches and fire starter. I was shocked that any land manager in Southern California would encourage people to carry these items, and believe that their use is warranted. My house burned down in the 2003 Cedar Fire, which was started by a foolish lost hunter as a signal fire. But my opinion on this goes back to the 1970's, when I once had a conversation with a hiker who said that he would start a backfire to save himself, if he thought the circumstances warranted it. He was quite self-righteous about it, he clearly had the attitude that his own survival justified any action, and that he was the sole judge of what was appropriate. I was so shocked I could barely reply. With the amount of gray matter he had upstairs, a backfire he started would almost certainly have greatly increased his own danger, as well as that of everybody else in the area. About a week ago, I was talking about this with a volunteer ranger couple at the Tahquitz lookout. They said it is not unusual to see fires in the forest below. And this after the Mountain Fire. I am shocked too at this poor advice from the State. It endangers all of us. In addition, I could not live with myself if I ever started forest fire for the sake of my own survival. Like the volunteer rangers you met, I have seen fires and ashes from illegal fires started by narcissists in many places in the San Jacinto Wilderness. Here's a very famous short story by Jack London. Well worth reading. I don't want to make light of your loss, or cause you any distress, but the ability to make a fire has been (and will continue to be) one of the "Ten Essentials" that outdoorsmen and hikers in the backcountry should always have with them. Always. However, maybe the rangers should have included on that list the zero-th essential: A brain. I'm quite familiar with London's short story, I think most people are. I don't think there are many circumstances where building a fire makes the difference between surviving or not surviving. When it is cold, windy and wet, building and maintaining a fire is extremely difficult. Perhaps our ancestors were good at doing it with flint, steel and tinder. I don't think many of us are very good at it today. I remember once returning to camp from a cold, windy and wet day climbing two peaks in the Sierras. We started a fire to warm up and dry out. We had a fire pit, and encouraged the fire with gasoline from our supply of stove fuel. I was impressed with how difficult and ineffective it was. The lesson for me was that you rely on the clothing you carry in your pack, not starting a fire. And the clothing available is better now than it was then. I think there are enough people with poor judgment out there that I favor simply banning any fire. 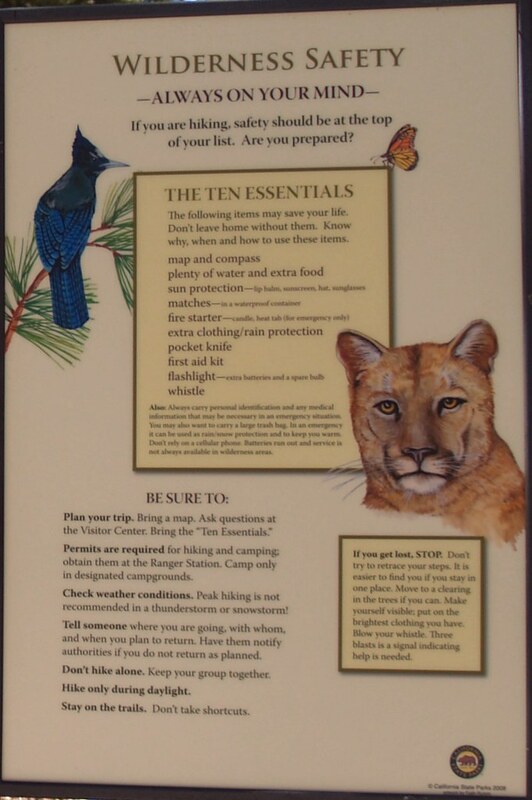 The Ten Essentials list was created decades ago in the Pacific Northwest. I don't think people should be encouraged to carry matches and fire starters in Southern California today. When I mention that my house burned down in the 2003 Cedar Fire, I am not complaining or asking for sympathy. Fourteen residents of Wildcat Canyon died the first night, less than 12 hours after the fire was noticed. They had no warning and could not make it from their homes to Wildcat Canyon Road, which was a short distance away. That's the kind of loss that makes me angry, and very sensitive to fire issues. Wow! I go out of town for a couple of weeks and I miss out on an interesting topic like this? I have never been a fan of the "10 essentials" because I think a person should plan carefully enough and prepare accordingly so that they have almost a zero percent chance of running into a problem that would require the "10 essentials". Yes, it might require extra time and effort, but that is the cost of doing it right. Pay up or stay home...don't put other people's lives in danger because you didn't think this through. Some people, like HJ, do the planning and still believe in the process. That is the best case scenario, because anyone planning that well will both live through the experience and avoid causing harm to others. Still, there are many hikers, both new and experienced, and we have different life experiences so we come to different conclusions. However, the point of view on starting a fire seems to me pretty straight forward. Proper planning takes out 99.9% of the problem. But, if you need to start a signal fire, you should start it in an open area where you can control the flames - removing the immediate vegetation around your signal area seems rather obvious. A signal fire during the day would have to be rather large and create a great deal of smoke, so it would make sense to try a small fire at night first, especially since the winds tend to be very low at night and the light would be obvious to a search helicopter for many miles. If you didn't have success that way, you now have a clear area where you can start a small fire in the morning, again when winds are low, and then add green vegetation or thick wood that will not gather speed but will create a great deal of smoke...and maybe have a pile of loose dirt at hand to slow the fire and cause more smoke if the need arises. I remember a couple that got lost on San J and found the tent and journal of a man who died waiting for help. They started a signal fire and survived in the same location. Trying to start the mountain on fire, which seems to be the first thought of some lost hikers, is a stupid and dangerous proposition. But, as with anything else, the degree of use is not equivalent to any use whatsoever. If it were used very cautiously and prudently, a signal fire might save lives and cost nothing. The key here is in doing it with a clear head, employing a thorough understanding of how to do it, and letting each measure work through its course. "I'm scared! Let's set the forest ablaze!" is simply hysteria being acted out by someone who was unprepared. And that creates the worst case scenario that you were talking about Ed. If I get lost, I do not have the right to sacrifice the lives of 12 other people to save my own. It's not that hard to think things through. Things come out so much better when people do. Planning and preparing are not the fun part. But they sure do help in avoiding the really bad part. Here's a shot of the offending sign. Note that fire is mentioned TWICE! That's how important it is. zippetydude wrote: The key here is in doing it with a clear head, employing a thorough understanding of how to do it, and letting each measure work through its course. "I'm scared! Let's set the forest ablaze!" is simply hysteria being acted out by someone who was unprepared. Exactly. People who panic tend to make poor decisions. That's how those so-called "signal" fires start. But signal fires are NOT what the Ten Essentials are all about. They are about having the means at hand to help you survive when something goes wrong. That's why fire is on the list. Survival fires are used to prevent hypothermia, not burn down the woods. I realize that it's purely anecdotal evidence, but I know of at least two recent situations in which fire was instrumental in helping people survive in the San Jacinto's, within a mile of that sign. 1) See page three of the "tram station leaving people to die" thread. Seventeen people were stranded in Long Valley overnight in twenty-degree weather when the tram closed due to high winds. They used a fire effectively, and all survived without frostbite or other injury. 2) Norma R and Dave G (members of this forum) were forced to bivy on their first Skyline attempt back in 2007. Cy Kaicener showed them the way by hiking with them up to the snow line at 4000 feet and then turned around as he didn't want to hike on snow. They continued upward and had trouble on the traverse section, so, rather than call for a rescue, they made a bivy under some large boulders and used their space blankets, which weren't enough. They ended up lighting a small fire and kept it going all night. They hiked back down the next day without incident or injury. Trip report by Dave G on another forum. Note that both of these instances were on snow, when the chance of a wildfire is minimal. Just the same, making a fire made all the difference. jfr wrote: I realize that it's purely anecdotal evidence, but I know of at least two recent situations in which fire was instrumental in helping people survive in the San Jacinto's, within a mile of that sign.....Note that both of these instances were on snow, when the chance of a wildfire is minimal. Just the same, making a fire made all the difference. I agree that in snow, the chance of a wildfire is minimal. I don't agree that a fire often makes a big difference. I've had enough experience with cold weather and campfires to believe that clothing is far more important than a fire. Most of the heat provided by a fire is dissipated in the air, particularly if it is windy. The problem with treating fires as acceptable is that people who find themselves in situations where they think a fire is desirable or necessary are often the ones you don't want making a fire. In my view, the massive destruction we know is caused by wildfires far outweighs questionable anecdotal evidence that a fire actually saved lives in a few cases. We could do away with stop signs and red lights if everybody exercised good judgment at intersections. But that is not the case, so we have stop signs and red lights, and laws that require us to observe them even when we sometimes know it is safe to ignore them. Touche'! Well, I know, we are not going to persuade each other, but we are having a good discussion. My bottom line is that if I am going to spend a cold night in the open, I would rather have an emergency space blanket, a foam pad to sit on, and a pair of chemical hand warmers for my cold-sensitive fingers than matches and a fire starter. And I often carry them. I was checking my memory banks for people I knew who died of hypothermia. The name I came up with was Vi Grasso. I was an active climber in the 1970's, Vi and I moved in the same circles, and were often on the same trips. A very memorable person. I dropped out in 1978 due to knee injuries. Vi froze to death in October, 1994. Not on Denali or Everest, or even a winter climb in the Sierras. On Ken Point, a 6432' peak on the Desert Divide not far from the PCT. On the USGS topo, it is not even a name, only an elevation. When I found out about it, I contacted an old friend to see what he knew. Vi was hiking alone that day. She was in a hurry to complete the Hundred Peaks Section List, to become what the Sierra Club calls a Triple List Finisher, someone who has completed the Sierra Peaks Section, Desert Peaks Section, and Hundred Peaks Section Lists. I think a date had already been set for the celebration. She signed in on the summit. Her body was found a few hundred feet lower, huddled over what looked like an attempt to build a fire. The autopsy concluded she died of heart failure, but evidently that is common in the final stages of hypothermia. I found it a disturbing story, and still do. Vi was a very experienced mountaineer when I knew her, and had 16 more years of experience when she died. Why did she set out on a long hike on a day with a severe storm moving through Southern California, without the clothing to make it back to her car? Given that she did, why didn't she turn back when she saw the storm approaching? The only explanation I can come up with is that Vi did have an impulsive, impetuous streak, and probably figured she could outrace the weather. Doug Mantle has a tribute to Vi in the October 2005 Sierra Echo, p. 39. A couple of years ago, at the end of December,I took an overnight trip in the Santa Rosa wilderness. My goal was to sleep on top of Martinez mountain. A storm had covered the area in snow but had cleared to a stunning blue sky with a sharp north wind. Getting a late start, the beauty of the day pushed me on at a fast pace slowed somewhat by the snow and wind. By The late afternoon the wind died and the sun disappeared behind the walls of the canyon I was climbing and the cold and fatigue was becoming debilitating. I decided to crest the ridge and make camp short of my goal. Once set up,I noticed my gear was already frozen though still in daylight. As it got dark, my water supply froze solid. I crawled in the mummy and tried to sleep. Wrapped in all I had I soon woke up shivering uncontrollably. This would cause my fatigued legs to cramp intensely and require jumping out of the bivvy to straighten up. By this time the temperature was 4. I cleared a large area of all branches, dug out some snow and made a double ring of small and large rocks close to a boulder, built a small fire from bare branches taken from a fallen Pinon, and sat there until the sun came up. When things don't go as planned, I look at the mistakes I made. 1-underestimating the weather. 2-unrealistic goals. 3-Not packing correctly. If you must use fire, you must know how to do it safely and sensibly!